Great customer service and beautiful products! My selections were pretty online, but even more beautiful (and unique!) in person! I was experiencing website issues and Esmerelda helped me out via email. My items were delivered super quick. I ordered online on a Thursday afternoon and received the item in Saturday's mail. The earrings are beautiful! Cute, original, and affordable jewelry. Excellent service too. Esmeralda was very nice and responsive to my questions and I am happy with my earrings. I bought silver bird earrings for my mother-in-law and she loved them. Great selection of jewelry gifts, affordable prices, easy to navigate website. I will come back! Fast shipment. Ring is lovely, just a little small for the size I usually wear. I was very pleased with the merchandise I ordered. A man's bracelet. I like the design. I'm thinking it will be very nice nice at Christmas to have this to choose from. I got some earrings for my sister's birthday and she loved them! Super happy I used the service. It was so easy to use my $15 off and the item I chose came VERY quick! The necklace is just so beautiful! I liked that you had an option to pick it up for free. Although the location wasn't convenient for me, the shipping was a low cost and fair. I had a question on an item, and Esmeralda responded within 2 days. After I ordered the item, it was shipped immediately, and I received it within 2 days. The item is lovely, and the service was great. I LOVE my new earrings from Esmeralda Jewelry! Esmeralda runs an incredible business! The selections were gorgeous, varied and reasonably priced, I received personalized service even though it is an online transaction, and the jewelry came fast. It’s even better in person than I expected. I can’t wait to order again. 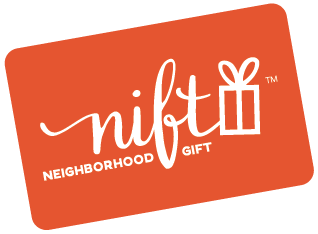 I’m so thankful to Nift for showing me this fabulous local business! The jasper earrings were unique and gorgeous! Im very happy with them!! Thank you so much !!! The gift arrived quickly, although since it was for a birthday the recipient didn't open it right away. It was well received. The only minor "concern" was that the business accidentally sent two of them. My mom did return the second. I loved that I could use it online! The earrings I got my partner were adorable. Super fast shipping! Fabulous place.Love the people and the jewelry. Love shopping local and fair trade. I did not see too many things I was interested in purchasing but the quality and style are great. The scarf I picked is beautiful and I will wear it often. Esmeralda shipped immediately and sent a nice handwritten note. Great selection at price ranges that could fit different budgets. I loved what I selected, very unique and wonderful. Can't wait to get the earrings I picked. They are just beautiful and I live that they are handmade! Such a lovely story! I have been there a few times now and each time they are welcoming and helpful, plus the jewelry is beautiful and affordable! Nice store, kinda pricey but only sells local jewelry so it's worth it! The sales person at Esmeralda Jewelry was very helpful in helping me choose a pair of earrings! I would definitely go back. The jewelry was very interesting. It wasn't too flashy, which I really appreciate. I got a bunch of stuff for Valentine's Day for my mom and my boyfriend's mom. The selection is very mature, so I got pieces that were appropriate for them. I love a lot of the materials used such as the crystals. All in all, I enjoyed their selection. I love the ring that I got from Esmeralda Jewelry! It came within 3 days of ordering, and it's great to know that I was able to support a locally owned business. Definitely my favorite ring I own now, and it fits as I hoped. I would have loved to use the whole $30!on my purchase but the site would not let me when I redeemed it. Beautiful selection, LOVE the fact they support fair trade. Will shop there again. Esmeralda was truly great their online store is very easy to navigate. I got an adorable pair of earrings for my 91 year old grandma who fell in love and is dying for me to take her to the physical store! great selection of unique pieces of jewelry at affordable prices!! thank you. loved the variety of handcrafted jewelry available. I made A purchase when I wouldn’t have done so otherwise! Esmerelda always chooses the cutest jewelry pieces! The customer service is excellent. Much prettier than they looked on the website. Perfect to wear in hot weather when I wear my hair up. Love the jewelry so unique ! Esmeralda is a really nice store. Shipping was super fast. Earrings were just as they looked. I loved them!!!! Very nice and affordable jewelry. I am looking forward to receiving the package. Esmeralda Jewelry certainly had a wide variety to choose from. I liked the collection. Thanks!